High grade paper masking tape for precise and flat paint edges. 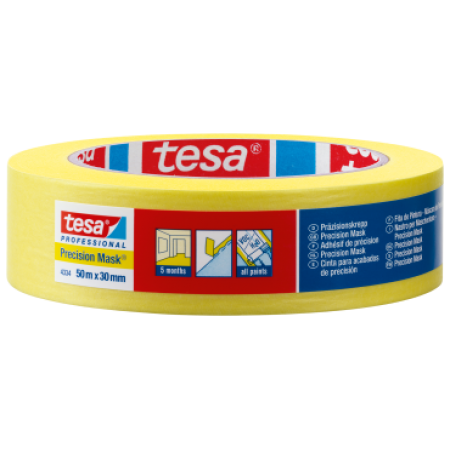 Main ApplicationsThis tape is suited for almost all indoor painting applications. tesa® 4334 Precision Mask is suitable for use with water-based paints and lacquers and even for spatula application techniques. It is suitable for a variety of common surfaces such as glass, aluminium, hard-PVC and wood. It is especially suited for indoor applications when a precise razor-sharp paint edge is needed. Tesa 4334 Precision Mask consists of an extra-thin and strong paper backing coated with an acrylic adhesive. The combination of the highly equipped backing material and the outstanding special adhesive formulation allows easy removability up to 5 months after application. This enables multiple working processes in only one covering process.